"There Are No Bears Left... None... Not A Soul"
Think back six months. Do you remember all the warnings from the legendary hedge fund managers about the impending stock market doom? Paul Tudor Jones, Scott Minerd, Larry Fink, Seth Klarman, the list is long but distinguished. At the time I penned It’s too easy to write bearish pieces. Even in late summer, gurus like Gundlach were bragging about the 400% he would make on his S&P 500 put purchases - Billionaire Bears. Given the atmosphere, I knew posts about the coming collapse would be greeted with tons of words of encouragement. Yet if I wrote something about the stock market continuing higher, crickets… Or worse yet, remarks about my cluelessness regarding the problems in the global financial system. I didn’t think stocks were going higher because everything was roses, no in fact just the opposite. Stocks were being pushed higher because everything was so FUBAR’d. Central Bank balance sheet expansion was pushing risk assets higher, and for the longest time, everyone wanted to fade it. Fast forward to today. Even the most ardent bears have given up and embraced the idea Central Bank buying will push stocks higher. Investors that were previously doom and gloomers are now speaking of blow off-tops. I can hear the capitulation in their voices. No more brave predictions of the coming collapse. Instead, meeker forecasts of a high volume runaway euphoria. There are no bears left. None. Not a soul. The bears have been replaced by gloating bulls that are openly bragging about how high the S&P 500 futures will gap up Sunday night. They are mocking the bears with taunts of how much money will they lose fighting the rally. They joke about buying the dip, which increasingly is becoming more and more nothing more than a couple of downticks. Ask yourself what would embarrass most investors right now? Would it be a continuing rally? Not a chance. Given the white flag waving by the bears, and the over-enthusiasm of the bulls, there is little doubt in my mind that a stock market decline is what would hurt most. That wasn’t the case six months ago. Heck, it wasn’t even the case two months ago. But that’s where we are today. I could try to dig up some sentiment numbers, but the reality is I don’t need to. The mood is plainly obvious. Investors are as bullish as they have ever been since the Great Financial Crisis. Sure, you might argue that it was much more frothy in 1999. But who cares? 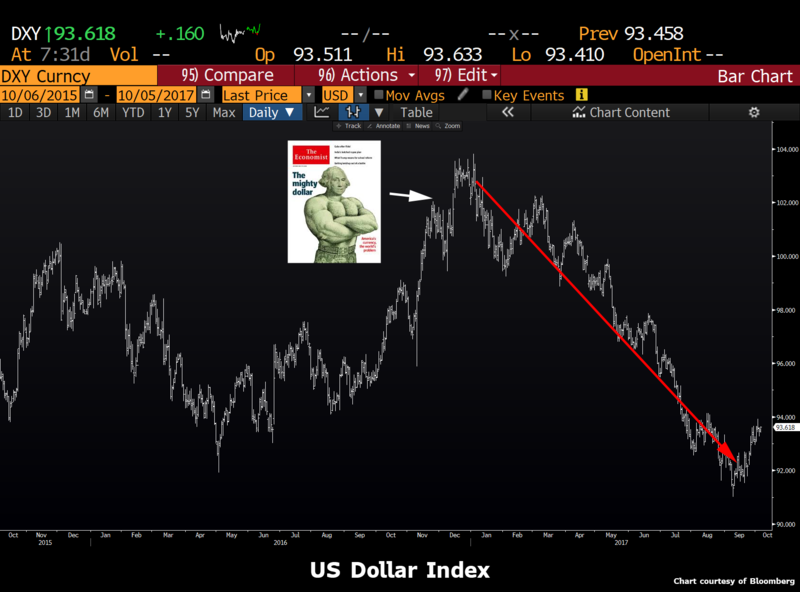 Do you really want to be buying based on the greater fool theory? Ask Chuck Prince how that turned out. It’s hard standing alone and fighting the crowd. If it was easy, everyone would do it. I have written about the new reality of how markets are now full of A Series of Rolling Mini-Bubbles, but a sharp Seeking Alpha writer by the name of Ian Bezek has done a better job than me of identifying the latest madness. 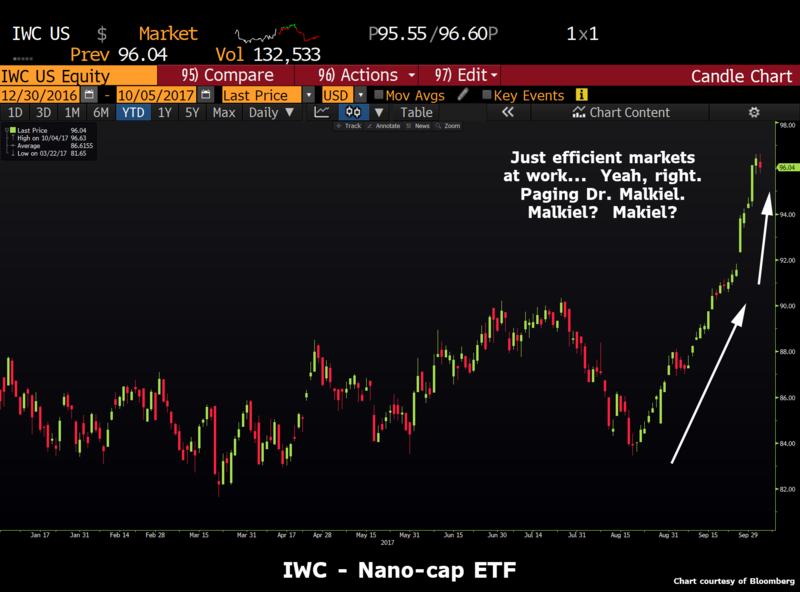 In his post, An ETF Levitates: This is Not Normal, Alex points out that the IWC nano-cap ETF has been up 26 of the past 28 days. This is the new reality. A series of rolling mini-bubbles. But you want to know the hardest part? Just when it looks best, is the time to fade it. I can already hear you saying to yourself, that’s a big leap. Selling it because it looks good? Well, in case you don’t believe me about the series of rolling mini-bubbles (remember, the keyword is mini), how about this for a reason? Almost everyone has now embraced the idea that Central Banks will push asset prices to the moon. 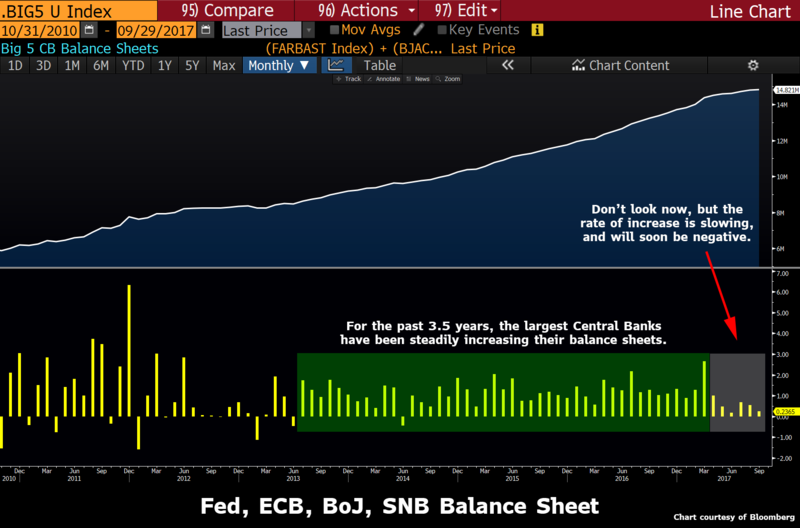 It’s like they just realized that with the balance sheet expansion of the ECB, BoJ and the SNB (Swiss National Bank), the monetary stimulus has been higher than any time except for the initial days of the crisis. One thing before I continue. For these Central Bank balance sheet charts, I have frozen the currency adjustments in time. If I let them float, then the balance sheet size will move around as the US dollar rises or falls. 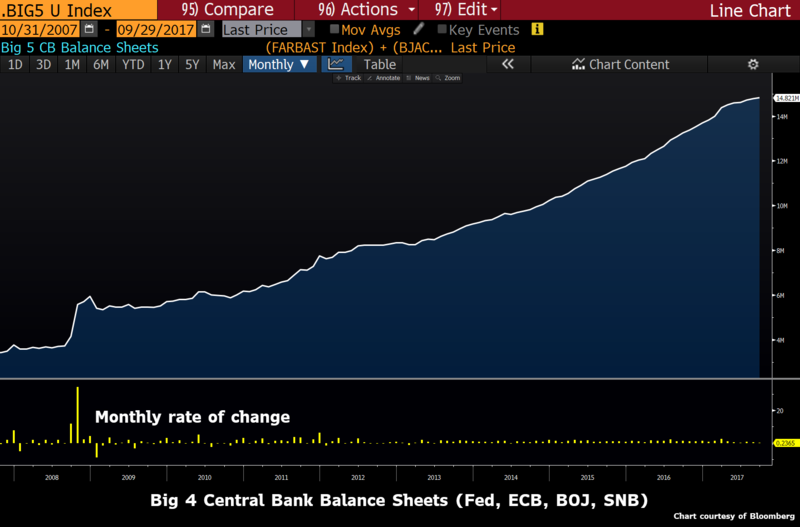 Since we are interested in how much the Central Banks are expanding or shrinking their balance sheets, this would lead to a distorted monthly change. Let’s zoom in and have a look at this a little bit more closely. It’s a little bit amusing that market pundits are now shouting about the inevitability of Central Bank buying. The reality is that from mid-2013 to 2017, the pace at which their balance sheets have been expanding has been ferocious. The ironic part? All these pundits have figured it out just as the pace has started to slow. Look at the last six months. Slowest six month period in the last few years. And guess what? It will be negative soon enough. The ECB will taper, the Fed will shrink, and if financial assets keep screaming at this pace, even the BoJ and the SNB might be forced to slow down their purchases. So yeah, knock yourself out buying stocks because Central Banks are printing like mad. Instead of examining what they did, I am more interested in what they will do. And to me, it looks like this game is nearly over. Nothing sums up better the crazy rush into stocks than the recent headlines. 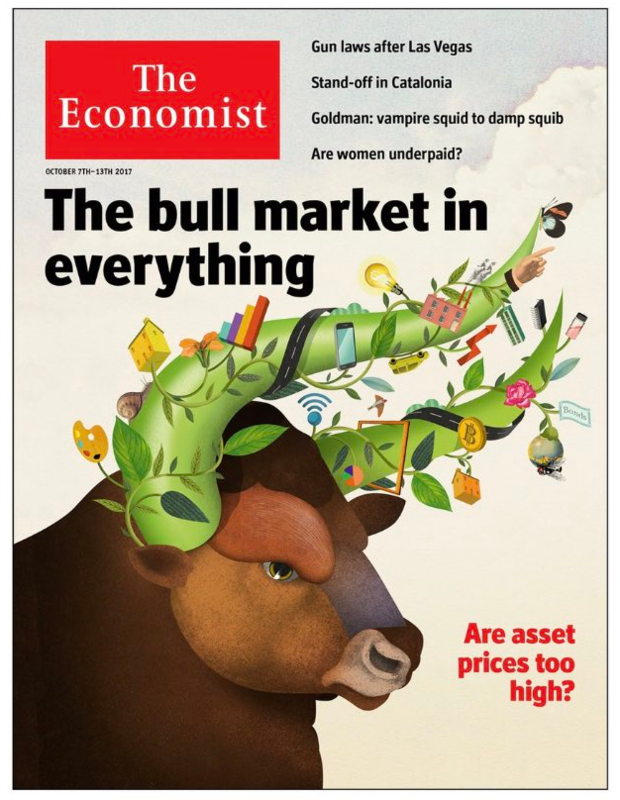 Remember the last time the Economist came out with a bold cover like that? We have nano-cap ETF’s rising more in a period of a month than they have ever done before. 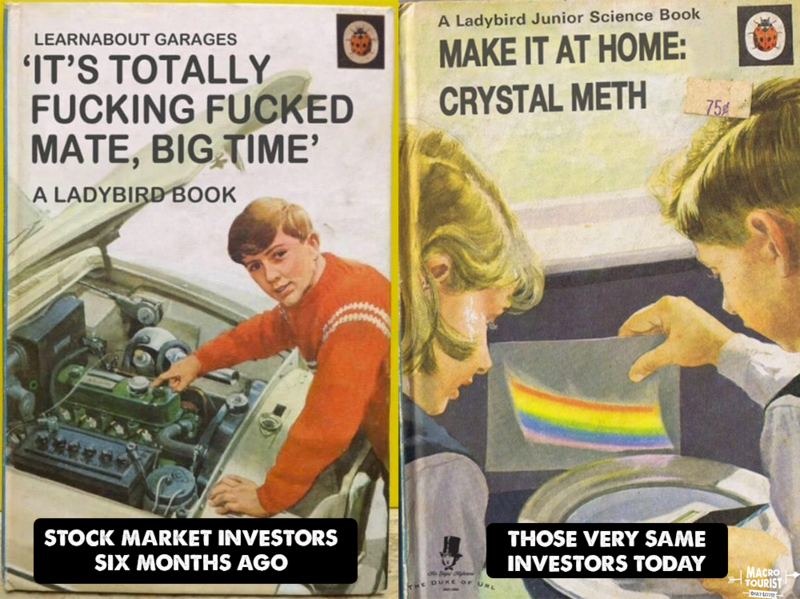 I have former bears telling me how we need to have a blow-off top before the true bear market can start. As far as I can tell, there is absolutely no one who thinks this market will head lower over the next month or two. Well, sold to them. Given the dirt cheap options they are all selling to gather extra premium (it’s free money after all - stocks never go down), I think taking the other side of their trade via long put positions is a great risk reward. I know this trade is lonely. Jeez, as I write this, a little bit of me wonders if I have gone insane. Then again, Livermore killed himself in the cloakroom of the Sherry Netherland Hotel. He left a note that he was tired of fighting. Good thing Jesse isn’t around to see this bull market.